Croatia have secured their space in the World Cup final this year. Sporting history is full of stories of underdogs who defy the odds to triumph over bigger teams. Leicester City’s fairytale rise from the bottom of the United Kingdom's Premier League in 2015 to the top in 2016 is one memorable example, while both Denmark and Greece have triumphed at the UEFA European Championships. Now Croatia, a nation with a population of just 4.2 million, has secured a place in the World Cup finals for the first time. And they’re not the only tiny country to do well in the tournament. Uruguay – population, 3.4 million – made it to this year’s quarter-finals slaying mighty Brazil with a population of 207 million. Croatia triumphed over England in the World Cup semi-final. Of course, being a large nation is certainly not an essential ingredient for success in football. If that were the case, China, India and the United States would have at least qualified for the World Cup group stages. But what about success off the pitch? Small countries often appear at the top of rankings for wealth (Qatar), innovativeness (South Korea and Sweden), happiness (Finland) and gender parity (Iceland). And when it comes to competitiveness, they’re also demonstrating that they can punch well above their weight and leave larger economies by the wayside. 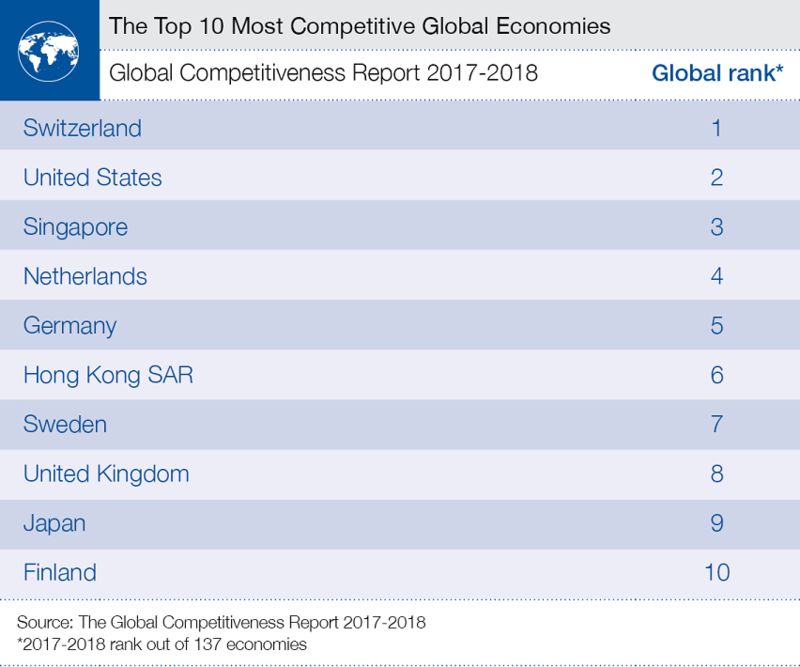 Switzerland, with 8.5 million people, is in pole position on the World Economic Forum’s 2017-2018 Global Competitiveness Index, while Singapore, a city-state with a population similar to Minnesota’s at 5.5 million, is third after the US. 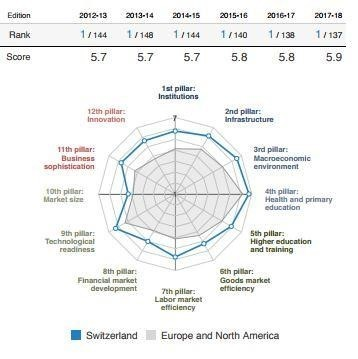 In the case of Switzerland, which tops the overall ranking for the sixth year in a row and scores well on nearly every pillar of competitiveness, it’s down to a resilient economy, strong labour markets and innovative and sophisticated businesses. Singapore, which slipped one place this year to third, mainly on account of rising government debt, put in a strong performance across the board, according to the report. Its transport infrastructure, product and labour markets, and financial sector are all highly efficient. If population size doesn’t seem to be a key factor – on or off the pitch – then what is it exactly that makes a small country competitive at the global level? Agility, speed and the ability to change direction quickly are often thought to be key factors when thinking about the merits of smaller countries, organizations and even players. But how bigger countries can replicate the success of smaller ones is a question that will continue to trouble both economists and football fans for some time to come. How do World Cup matches affect the stock market?